This template tag is now deprecated. It’s functionality has been split off into a new project that can be found here: Django CMS Bootstrap 3. Although it’s not derived from the CascadeElement class, this Django app is shipped with a template tag to render the main menu inside a Bootstrap Navbar. This tag is named main_menu and shall be used instead of show_menu, as shipped with the DjangoCMS menu app. Bootstrap3 does not support “hover”, since this event can’t be handled by touch screens. Therefore the client has to click on the menu item, rather than moving the mouse cursor over it. 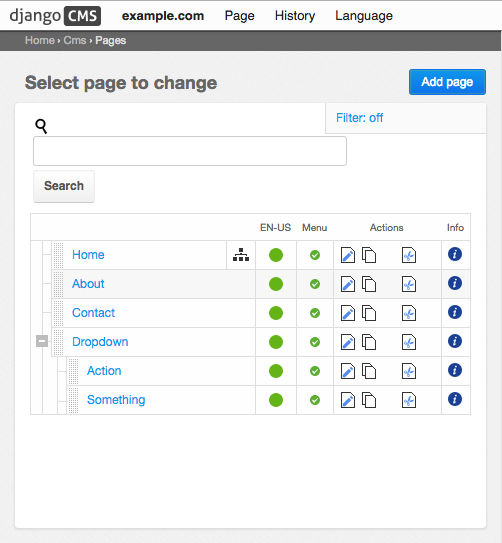 In order to make CMS pages with children selectable, those menu items are duplicated. For instance, clicking on Dropdown in the Navbar, just opens the pull-down menu. Here the menu item for the page named “Dropdown” is rendered again. Clicking on this item, finally loads that page from the CMS. 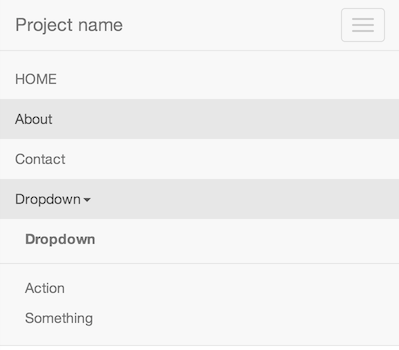 Bootstrap3 does not support nested menus, because they wouldn’t be usable on mobile devices. Therefore the template tag main_menu renders only one level of children, no matter how deep the page hierarchy is in DjangoCMS.